The Most Expensive Super Bowl Rings Were Purchased By Which Team? When a football team in the National Football League (NFL) wins the Super Bowl, they’re awarded with a custom-made ring celebrating that win. The practice of awarding the rings dates back to the start of the Super Bowl itself in 1967 and serves as a way for team members, coaches, and support staff to celebrate the victory and carry a memento with them (since there is only a singular physical trophy awarded for the win). The NFL gives each team approximately $5,000 for each ring and limits their coverage of the expenses to the first 150 rings. Any additional cost is borne by the team franchise and it is at the discretion of the franchise as to what the design will be, what precious metals and stones are used, and, ultimately, what the expense of the ring comes to. When it comes to splashing cash on Super Bowl rings, nobody knows how to dazzle like the New England Patriots. The rings commissioned for their 2015 win were valued at $36,500 each. 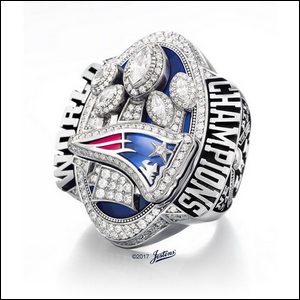 Their 2017 ring, seen here and crafted by Jostens—a company well versed in Super Bowl rings and memorabilia—was never publicly valued, but is even larger than their 2015 ring and, according to Jostens, the largest championship ring ever made.